Today’s home remedy is for common cold and cough. There are no cure for this and also very rarely fatal to others. Home remedy and some known pills only can give some relief to the sufferers. It is most common illness in kids under the age 5 yrs. I would suggest all mothers not to use any home remedy or medication for kids under the age 5 year without doctor consultation. So here is one remedy for kids older than 5 year. • Boil all the above mentioned ingredients with a cup of water except honey. • Mix honey with this water. • Give it to you kid when it is warm. • Adult also can try this remedy ,it gives lots of relief, but only remember that the quantity should be doubled, for adults. • Along with this remedy, drink lots of fluid, it will save you or your kids to get dehydrate. • Drink fluid which contain Vitamin C and zinc since these two elements increase you immunity. • Don’t eat and drink anything which is cold. • Take at least 8 hrs of sleep every day. • Avoid going to public places if you have cold and flu to save other people from infection. • If you feel that your illness increasing then please visit doctor without any dely. 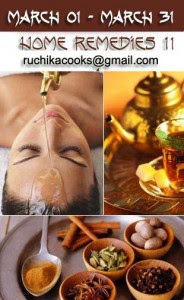 Subha, thanks for the entry, could you link it to my blog http://ruchikacooks.com and also to A2Z vegetarian cuisine? The use of logo is also a must, I have your entry but could you please update it?